The Member of the Wedding (1946) is a tale of the search for belonging, played out against the individual struggle of adolescence, and the larger catastrophe of World War II. Frankie Adams is a lanky twelve year-old girl, desperate to find a group to belong to. She becomes fixated with the idea of joining her brother, Jarvis, and his fiancée, Janice, on their honeymoon, and her romantic visions of the future cascade into what becomes a series of erratic and manic actions. Carson McCullers lived a short, turbulent life. She married her husband, Reeves McCullers, twice, though both carried out affairs. He was injured in the battle of Normandy, and committed suicide in 1953. Plagued with ill-health from her teenage years, Carson McCullers suffered two strokes before the age of 30, and died at 50 after a brain haemorrhage. She was the author of five novels, two plays, and twenty short stories, as well as numerous non-fiction works. McCullers has received a great deal of critical acclaim, and her adaption of The Member of the Wedding into a Broadway play enjoyed a run of more than 500 performances from its opening date in 1950. Amongst other accolades, she was awarded two Guggenheim fellowships (1942, 1946). However, the spotlight on her work and career has faded in the decades since her death, and her skill at conveying the isolation of the individual and the terrible depths of love. 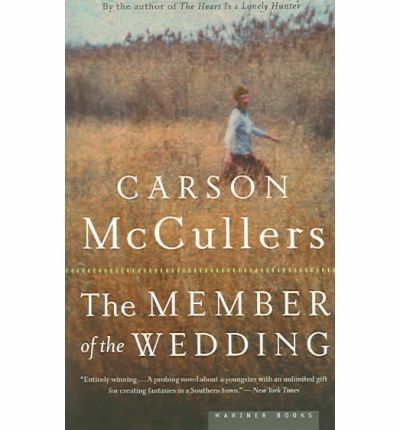 The Member of the Wedding is a short novel, but its length does not inhibit McCullers’ ability to create a tense and emotional story. Set in the American South in 1944, the majority of the book spans three days in late August, as Frankie longs for “the we of me”. Although the concept of a girl dreaming of running away with newlyweds may seem twee, The Member of the Wedding is anything but fanciful. Frankie is determined to cast off her childish identity, and reimagines herself as “F. Jasmine” in order to more fully become a member of the wedding party. Ignored by her disengaged widower father, Frankie begins to dress and act like a young woman, masking the innocence and naiveté of her true self. The near-tragic ramifications of her choices are particularly resonant, and bring sheer terror to the reader. Each character in The Member of the Wedding enhances McCullers’ diorama of the loneliness of existence. Frankie, of course, is the heart of the novel, and her emotional and sexual stirrings are acutely felt by the reader. Chief amongst the supporting characters are the housekeeper, Berenice, and Frankie’s ailing cousin, John Henry West. Berenice provides what Frankie lacks, particularly knowledge of love and relationships. Her situation also represents the separation between two entities, as she has black and white physical attributes. Through Berenice, Frankie begins to learn of a struggle for identity and belonging greater than her own. John Henry is the old-soul child to Frankie’s naive adolescent. At the tender age of six, he is the opposite of Frankie in action and demeanour. However, through his muted presence in the novel, he is more of a physical representation of the youth Frankie so desperately wants to shed, than fully-fleshed character. The quest for identity and the racial tension in the novel, and more broadly across McCullers’ works, would be echoed in Harper Lee’s To Kill a Mockingbird (1960). In fact, the infamy of To Kill a Mockingbird may have lessened McCullers’ time in the literary limelight. McCullers wrote to her cousin regarding Lee, cattily commenting that “Well, honey, one thing we know is that she’s been poaching on my literary preserves”. Whether McCullers is read as a precursor to Lee, or as a pioneer of the Southern Gothic genre, it is doubtless that she has earned her place in the annals of literature. I heartily recommend The Member of the Wedding as an introduction to McCullers’ oeuvre, for it transmits her overarching theme in a novella-length package. Like Frankie, The Member of the Wedding grapples with ideas and events that would shock even the most hardened of individuals. Despite its tragedy, The Member of the Wedding has moments of poignant hope and the charming optimism of childhood. “She decided to donate blood to the Red Cross; she wanted to donate a quart a week and her blood would be in the veins of Australians and Fighting French and Chinese, all over the whole world, and it would be as though she were close kin to all of these people. She could hear the army doctors saying that the blood of Frankie Addams was the reddest and the strongest blood that they had ever known”. In Frankie, we see the desire for belonging present in all of us. This entry was posted in Arts, Books and tagged book review, books, books you should have read by now, Carson McCullers, classic, literature, novella, Review, The Member of the Wedding. Bookmark the permalink.